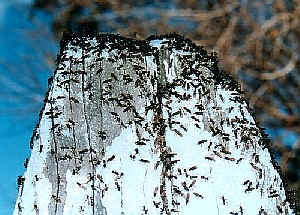 Ants is considered the highest form in insects evolution. They evolved the highly structured society. They have their powerful strings. They do not have many predators. They seem dominate in the insect class. They are quite different from others insects. However, if we learn more about Sawfly and wasp, we can see the evolution track from Sawfly to Ants. It is believe that the ancestor of hymenopterans, i.e., wasp, ants etc., look like the Sawflies today. We can find the special features in wasps and ants, the early images are still retained in Sawflies. How they got their strings? Sawflies are closely related to wasps. They got their name because the have their special egg-laying tool, like a saw, to cut through leaf tissue for their eggs. Their adults look similar to wasps except they do not have the 'waist'. Although sawflies do not sting, they use their ovipositors to cut open the surface of the leave to lay and insert their eggs inside. It is not hard to imagine how they accidentally turn their ovipositors to their enemy and become their weapon. By natural selection, their ovipositors become their strings. How they become the hard working parents? Although Sawflies do not supply food to their young, they guard them until they hatch. The female sawfly will stay near the eggs and watch her baby come out. Then usually she will die. But if some of the sawflies accidentally have a habit that she brings some food to her baby, and those food are accepted by her baby larva, it is a very good habit and natural selection will quit likely select this. The larvae will have a much better chance to live and become adults. Some of them will quite likely inherited the 'bring food to larvae' character. This group of sawflies will become more in number. The 'bring food to larvae' character will be enhance by evolution. After a long time, this character diverged and become the different form of parental care that we can see in wasp, ants and bees. How they build their society? 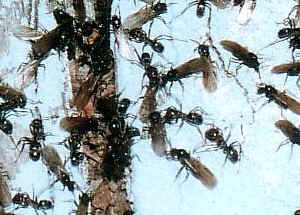 There are quite a number of different theories that explain why some of the hymenopterans are social insects. There is one or a few individuals who lay eggs, most others are workers and help to look after the young. It is general accepted that the major reason is the genetic structure of hymenopterans so the the kinship of sisters are even higher than mother and child. However I can see there is another factor, may be it is not as important as the kinship theory, but could be important in the beginning of the hymenopterans society evolution. We can see this from the sawfly. The larvae of sawflies, unlike more other caterpillars of moths and butterflies, are always stay together when at rest. If so happen that they stay together in a nest even after some of them become pupa. Some of them become adults. Adults lay more eggs in the nest. Adults bring foods to the nest. Now you can see the primary form of the society has just formed. Last updated: November 02, 2006.